John Migliori with a 12” golden trout he caught at Melville Pond, Portsmouth. 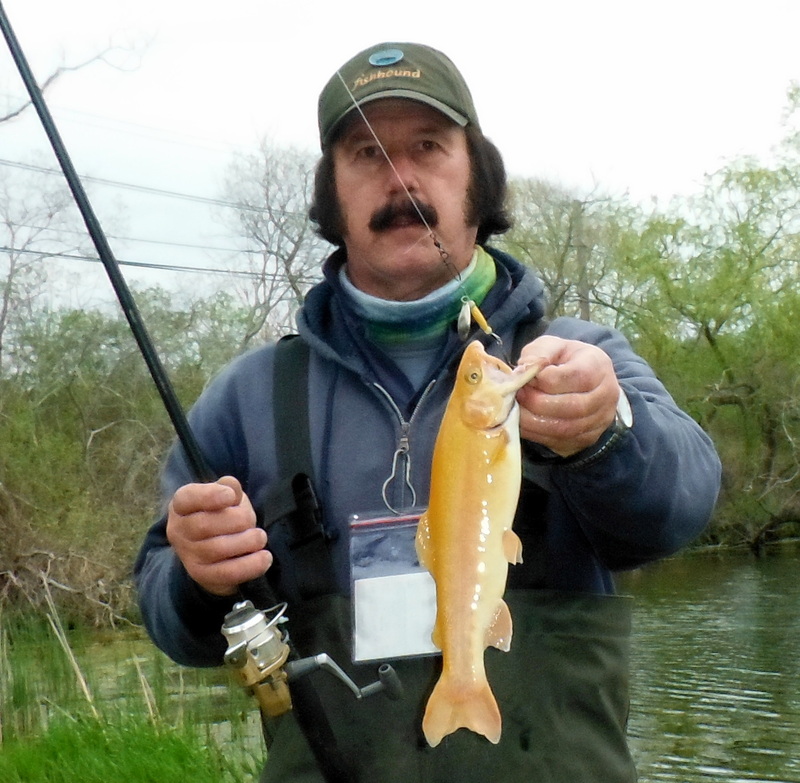 Take a picture with your golden trout and send it to Jessica.pena@dem.ri.gov to receive a golden trout pin. The Rhode Island Department of Environmental Management (DEM) will hold Free Fishing Weekend Saturday, May 6th and Sunday, May 7th. As part of the event, the public is invited to fish without a fishing license or trout conservation stamp in the state's freshwaters. Six local ponds will be stocked with over 6,000 rainbow trout and 4,000 golden trout for the event. Stocked waters include: Peck Pond, Burrillville; Browning Mill Pond, Exeter; Silver Spring Lake, North Kingstown; Upper Melville Pond, Portsmouth; Meadowbrook Pond, Richmond; and Shippee Sawmill Pond, Foster. The free fishing program was established in Rhode Island in 1995 as an opportunity to encourage people to experience freshwater fishing as a new outdoor experience and highlight some of Rhode Island’s premier freshwater fishing areas. Anglers who catch a golden trout on free fishing weekend and throughout the season will receive a free golden trout pin. 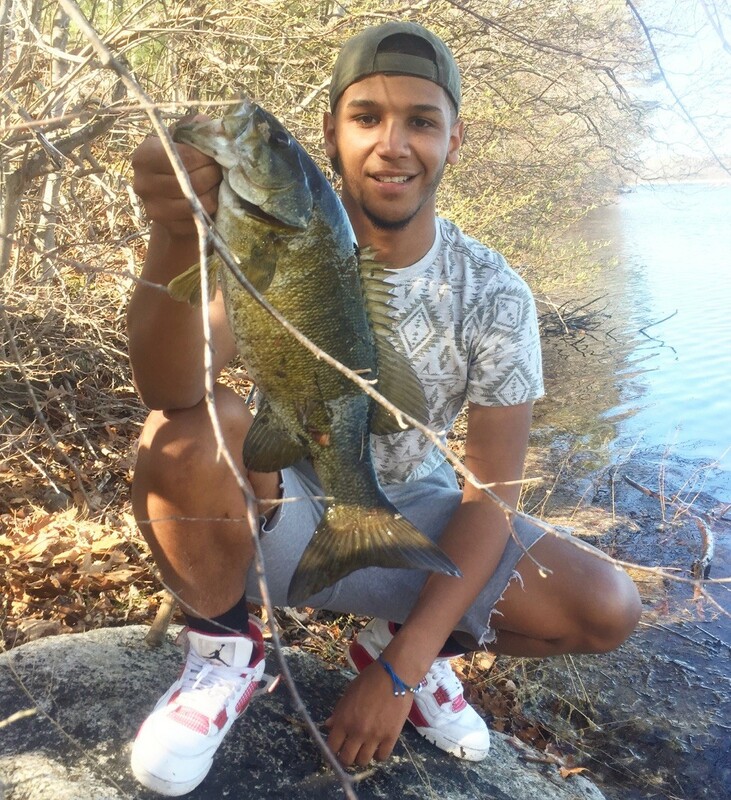 Take a picture of your catch and send it to Jessica Pena at Jessica.pena@dem.ri.gov . Free fishing weekend does not apply to saltwater fishing. Freshwater fishing regulations on size and limits apply on May 6th and May 7th. For more information or to purchase a license, visit www.dem.ri.gov. It was about half way thought the commercial fishing workshop Tuesday night at the URI Bay Campus when fisherman John Walker recommended a change in license use regulations that made a lot of sense to most fishermen and Department of Environmental Management (DEM) staff persons in the room. Fisherman Greg Duckworth said, “This recommendation makes a lot of sense to me, whatever we have to do to make it work should be explored.” DEM is taking the suggestion under advisement and will explore if and how such a change could be implemented. Another proposed regulation discussed at the meeting was a regulation similar to one that exists now for lobster pots. The regulation would prevent all pots such as eel and crab pots from being raised an hour after sunset and more than an hour before sunrise. The aim of the proposal would be to prevent poaching, however, fishermen felt the regulation would be restrictive as some fishermen now raise their pots early morning to sell crabs, or set them a dusk, etc. Workshops such as the one held Tuesday night are designed to seek fishermen input on regulations. Regulations and proposals discussed will be explored further and presented at a public hearing in June. Ocean State Tackle, Providence will have Al Gag of Al Gag’s Fishing Lures at their store for a demonstration on Sunday, May 7 from 10:00 a.m. to 2:00 p.m. Meet the inventor of the Whip-It Eel and the Whip-It Fish and learn how to fish the lures. For information contact Dave Henault at 401. 749.3474. Two quahog transplants will take place this month. This is the program that uses local quahogers to dig quahogs out of restricted areas and move them to clean waters. On Wednesday, May 10th a transplant will take place at Greenwich Cove and Thursday, May 11th a transplant will take place at Bristol Harbor, starting at the Independence Park boat ramp. Licensed commercial shellfishermen will be paid $7/50 pound bag and those assisting with dumping $10/50 pound bad. Both transplants will take place from 8:00 a.m. to 12 noon. Shellfishermen should report to the on-site DEM enforcement patrol boat by 8:00 a.m. on the day of the transplant. The shellfish transplant program is a cooperative effort between DEM, the Narragansett Bay Commission, the shellfish industry, and the RI Department of Health. 2017 transplant funding is provided by the Narragansett Bay Commission. Striped bass fishing in Southern, RI is exploding. Matt Conti of Snug Harbor said, “Bass fishing is phenomenal. A customer caught a 31” fish off the West Wall (Harbor of Refuge) this weekend with school bass being caught in mass at the Wall and on Matunuck and Charlestown beaches. The ponds in Charlestown, Ninigret and Narrow River are all hot too.” Anglers have caught as many as twenty school bass on an outing in Greenwich Cove (spreading to Apponaug Cove in Warwick too). “School bass with keeper bass mixed in are being caught everywhere including the Warren River, Kicketmuit River and all the way up to Pawtucket.” said Many Macedo of Lucky Bait & Tackle. “We have a lot of school bass in the 14" to 15” range being caught but no reports of keepers really arriving yet.” said Mike Wade of Watch Hill Outfitters. “Squid fishing is hit or miss with anglers catching as much as ½ bucket (a five gallon pail) fishing in the Newport and Jamestown.” said Manny Macedo. “The squid are in and out depending on the day in Rhode Island with large numbers being taken in Hyannis, MA.” said Dave Henault of Ocean State. Dareus Boragine of Cranston (and an associate at The Tackle Box in Warwick) with a 3 lb. 1 once bass he caught in the Pawtuxet River last weekend. Fish advocates: Capt. Dave Monti of Warwick, RI and Patrick Paquette of Hyannis, MA visited Capitol Hill last week to advocate for the fish and recreational fishing. 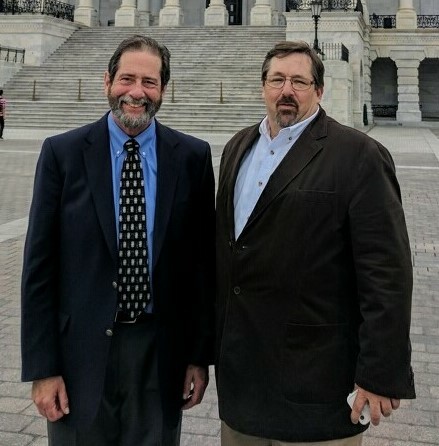 I was in Washington, DC this week with fishermen throughout the country advocating for the fish. The fishermen I was with met with Rhode Island and Massachusetts senate and congressional offices to gain their insight and update them on important fisheries issues. The Rhode Island senators and congressmen do a good job when it comes to fisheries. In fact Senators Reed and Whitehouse have been on the forefront of not only fisheries issues but important related climate change issues such as rising water and erosion of our coastline, warming water and its impact on fish and fishing. We are in good hands in Washington. Key issues discussed included the impact of recreational fishing. According to a NOAA study, recreational fishing has a $200-million dollar annual economic impact on the State of Rhode Island. However, three bills introduced in congress (with versions soon to be introduced in the senate) would have a major long term impact on both commercial and recreational fishing. House bill H.R. 200, introduced by Representative Young (Alaska) and H.R. 2023, introduced by Representative Graves (Louisiana) would both liberalize the Magnuson-Stevens Act (the fishing law of this nation) allowing more fish to be taken out of the ocean for the short term financial gain of some. These short term gains would be possible by eliminating the need for Allowable Catch Limits (ACLs) on rebuilt fish stocks. A quick assessment shows that if these bills passed, possibly all but 30 of 400 species would have Allowable Catch Limits. Fish stocks have been rebuilt in this nation in part due to Allowable Catch Limits. To eliminate them on stocks that have rebuilt could take away the gains we have made to rebuild stocks and allow species to become overfished before catch limits can be put back in place. These bills do not put fish first, they do not grow fish to abundance for all to catch and eat but rather put fish stocks at risk for overfishing making them available for short term gain for some. New Jersey Congressmen LoBiondo and Pallone sponsored a bill H.R. 1411 that would prevent NOAA Fisheries (NMFS) from implementing regulations that would reduce summer flounder harvest limits. Summer flounder spawning stock has been down for six years in a row and coastwide anglers have overfished. With this declining biomass and overfishing the Atlantic Marine Fisheries Commission (ASMFC) that regulates summer flounder coastwide found it necessary to reduce commercial and recreational harvest levels by about 30% in 2017. The Magnusson-Stevens Act has given NOAA Fisheries the authority to manage the fish to grow them to abundance for all. Under this federal fishing law over 40 fish stocks have been rebuilt. Weakening Federal fishing laws would allow states motivated by self-interests and short term gains to manage fish with their best interest at heart and not the best interest of the country or the fish. More to come as these Bills and others if they develop further in Congress. Snug Harbor Marina, South Kingstown, will hold its annual Used Tackle Sale event on Saturday, April 29, 9:00 a.m. The shop will be open for the season starting Sunday from 6:00 a.m. to 5:00 p.m. every day. For information call 401.783.7766. Snug Harbor Marina is at 410 Gooseberry Road, South Kingstown. Tautog fishing is receiving mixed reviews. Most anglers and bait shop owners are reporting a very slow bite. However, some customers of the Tackle Box in Warwick are landing fish. Dareus Boragine of Cranston, a sales associate at the Tackle Box, said, “We have had keeper tautog caught in the upper reaches of the Providence River and at Jamestown and Newport.” Elisa Cahill of Snug Harbor Marina said, “We have sold some crabs but have no reports of fish being landed.” Ken Landry of Ray’s Bait & Tackle said, “Customers have had negative results tautog fishing, no one has reported catching anything.” John Littlefield of Archie’s Bait & Tackle said, “Three customers fished the Conimicut Light area this week and had no luck. They caught one short fish. Others fishing the Wharf Tavern from shore got no bites at all.” The hope is that the tautog bite will improve with the warm weather this week. Cod fishing was off this week. Still a lot of bait on the fishing grounds so party boat captains fishing for cod are optimistic.